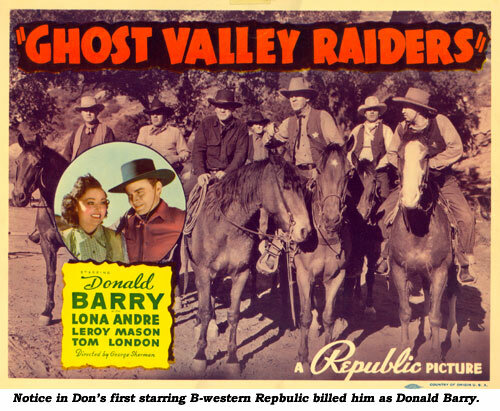 GHOST VALLEY RAIDERS (‘40 Republic) Government agent Barry goes undercover as a hardened outlaw to investigate the mystery of the missing stagecoaches. The gang blames Barry for the holdups and only Sheriff Tom London knows he’s innocent. 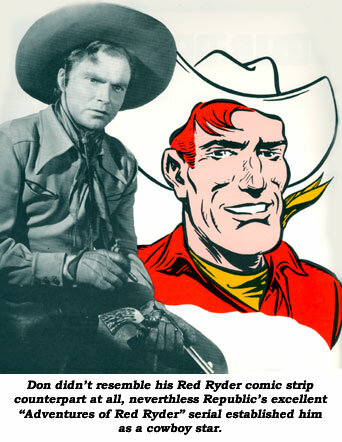 Don’s first starring B-western after scoring in co-starring roles with the Three Mesquiteers and Roy Rogers with his “Adventures of Red Ryder” serial still three months away from release. Don’s horse, Cyclone, shows more “thespic ability” here than in any of Don’s later westerns. ADVENTURES OF RED RYDER (‘40 Republic) 12 chapter serial based on the popular Fred Harman comic strip (which began in ‘38) is one of Republic’s best western serials. From the character, Donald Barry retained the nickname “Red” that remained with him throughout his career. The cocky Barry gives the role his all, but he was badly miscast (too short for Red Ryder) and he knew it, protesting long and loud to Republic prexy Herbert J. Yates—to no avail. Tommy Cook is Little Beaver and Maude Pierce Allen is the Duchess. Dave Sharpe doubles Barry. The intended routing of the Santa Fe railroad through Ryder territory prompts villains Harry Worth, Noah Beery Sr. and Bob Kortman to begin a reign of intimidation and murder to gain control of all the land comprising the potential right of way. The lighthearted strains of Stephen Foster’s “Oh, Susanna” as theme-music was inspired, remaining in the memory as truly unusual fight and chase music. 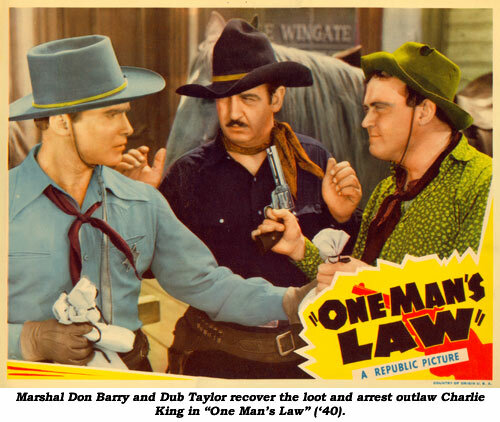 ONE MAN’S LAW (‘40 Republic) The lawless town of Trailcross cannot hope to attract the railroad until the ruffians are run from its midst, so the town hires Barry as Marshal to face the toughs. Dub Taylor, a sidekick fixture at Columbia and Monogram, makes his sole saddlepal appearance with Barry and at Republic. 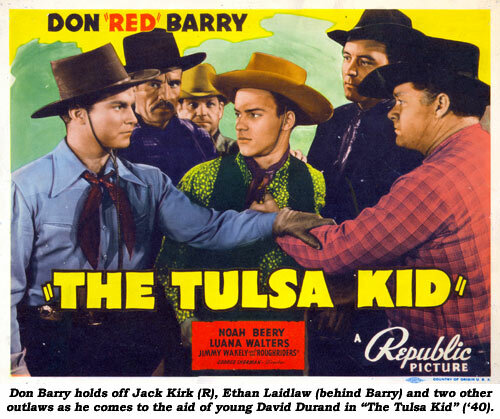 TULSA KID (‘40 Republic) A toss-up with “Days of Old Cheyenne” for the best Barry made. Both rank as prime B-westerns among all of Republic’s output. This one has Barry, an orphan of the range, brought up by professional gunfighter Noah Beery Sr. Barry becomes alienated from his foster father when he witnesses a killing in which Beery is involved and vows never to again carry a gun. Years later, Barry arrives in Wind River where town boss George Douglas is attempting to steal the water rights from settlers. When Barry comes to their aid, Douglas engages Beery Sr., not realizing the mutual respect the two hold for one another. This places Barry on one side of the law and the man who raised him on the other in a duel to the death. It’s purified action all the way, with a stop off for a tune by Jimmy Wakely and his Rough Riders. Screenplay by Oliver Drake/Anthony Coldeway, recycled from Drake’s “Guns for Hire” (‘34) with Lane Chandler. 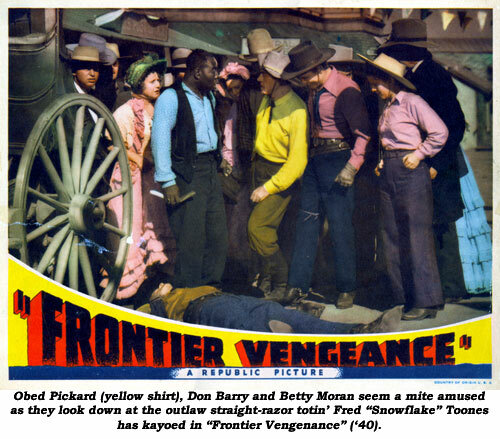 FRONTIER VENGEANCE (‘40 Republic) A couple of interesting musical castings give this otherwise routine Barry western some interest and historical significance. Perhaps the finest female composer in country and western music history, songwriter/singer Cindy Walker performs a song (and slight dance) midway. She had Top 10 hits in each of the past five decades including Eddy Arnold’s “You Don’t Know Me”, Merle Haggard’s “Cherokee Maiden”, “When My Blue Moon Turns to Gold Again”, The Ames Brothers’ “China Doll”, Gene Autry’s “Blue Canadian Rockies”, Roy Orbison’s “Dream Baby”, Jim Reeves’ “Distant Drums”, Jerry Wallace’s “In the Misty Moonlight” and literally hundreds more. She also composed (uncredited) all the songs used by Bob Wills and His Texas Playboys in the Russell Hayden Columbia series (save the standards Bob reprised himself). Obed “Dad” Pickard was the patriarch of one of the first country singing groups to professionalize country music, and one of the first to appear on national network radio, the Pickard Family. He was 52 when he gained fame as a soloist in the Grand Ole Opry in ‘26 and started making records for Columbia. By ‘28 he brought his family into the act starring on NBC’s “The Cabin Door”, a sort of minstrel show on radio. A second stint on the Opry followed, along with radio station work in New York, New Orleans, Philadelphia and other cities. “Dad” came to California and appeared in only three films, this being his only real acting role at age 66. He later had his own TV show in L.A. during the early years of that medium. Underhanded stageline owner Ivan Miller wants to drive Betty Moran and her Pop out of town, claiming all the business for himself. Miller’s wimpish son, George Offerman Jr., brings old friend and top six-up stage driver Barry into the firm, unaware of his Dad’s underhanded practices. When Don wises up, he quits and goes to work for Moran. It all culminates in a Republic staple—the stagecoach race for the mail contract. 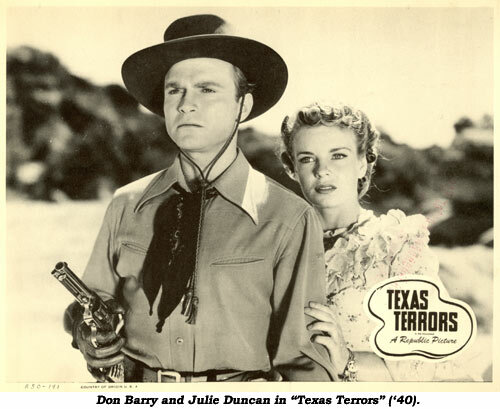 TEXAS TERRORS (‘40 Republic) The parents of young Don are gunned down before his eyes by claim jumping outlaws. Young Don promised his father (Hal Taliaferro) never to take up the way of the gun, but to depend on the law to right injustices, so Don becomes a lawyer. Years later, under an assumed name, he returns to bring justice to his parents’ killers. When Don’s legal tactics fail, he’s forced to break his promise to his dad and resort to six gun justice. The premise for “Texas Terrors” is lifted straight from John Wayne’s “King of the Pecos” (‘36). 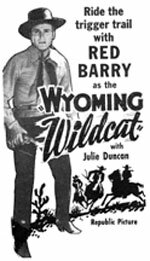 WYOMING WILDCAT (‘41 Republic) “Wyoming Wildcat” shows just how excellent a B-western could be in the competent hands of actors like Barry and directors like George Sherman. Compassion, drama and action as Barry returns home following the Spanish American War to find his father a wanted outlaw. Knowing Barry was a better than average western actor, Republic gave him some talented “opposition” in actors like Noah Beery Sr., Harry Cording and, here, Frank M. Thomas. 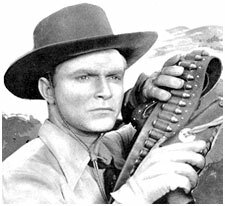 Barry’s saddlepal is Syd Saylor and his bobbing Adam’s apple who really got around, sidekicking at one time or another to the Three Mesquiteers, John Wayne, Tex Ritter, Bob Baker, Kermit Maynard and Buster Crabbe (at Paramount) but never lasting more than one entry except for four with Bob Steele at PRC in ‘46. Leading lady Julie Duncan, under the name Marjorie Manning, had won national horse show awards as one of the nation’s top steeplechase riders causing Republic to cast her in two of Barry’s westerns. 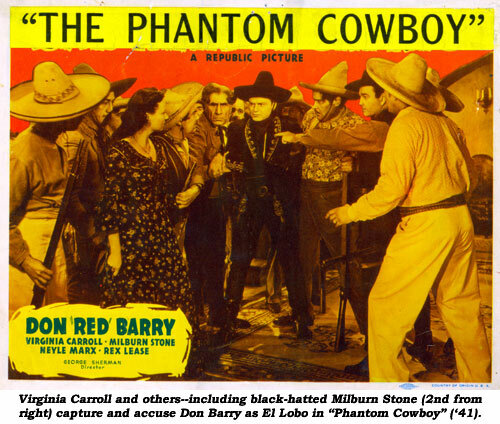 PHANTOM COWBOY (‘41 Republic) Another in Republic’s long list of Zorro variations, this time known as El Lobo. With that in mind, it should have been better, but somehow turns out to be one of Barry’s weaker westerns. Greedy ranch manager Milburn Stone plots to drive off the peons before the late Don Jose’s will is read, and kill Don Jose’s ward Barry who dons a black garb and mask and becomes El Lobo, protecting the peons. 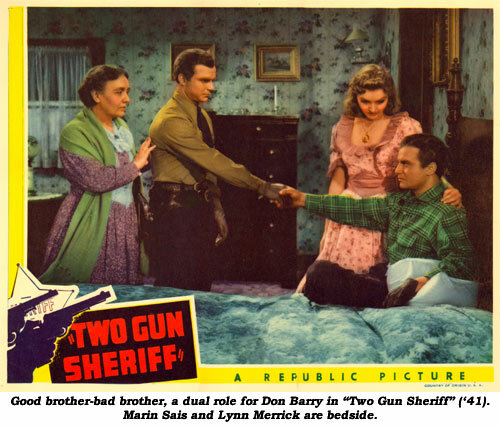 TWO GUN SHERIFF (‘41 Republic) Nearly every B-western star essayed at least one dual role. Don did it more than once. He proves his versatility and ability here, looking and acting quite creditable (and different) in both the good and bad brother roles. Actually, the bad brother, the Sundown Kid, receives the lion’s share of screen time as he joins and breaks up a secret gang of cattle rustlers who kidnap good brother Barry, a sheriff, and replace him with his outlaw twin. 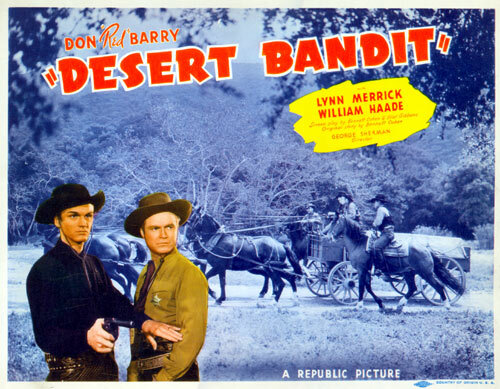 DESERT BANDIT (‘41 Republic) Texas Ranger Barry joins a band of gun smugglers in order to clear the name of his Ranger friend framed by the outlaws. Comic actor Tom Ewell’s film debut. He found lasting fame opposite Marilyn Monroe in “The Seven Year Itch”. Lynn Merrick, formerly Marlyn Merrick at Warner Bros., became Don Barry’s most frequent leading lady, co-starring with Don in 16 features. Screenwriter Bennett Cohen revived this plot for Hopalong Cassidy’s “Riders of the Deadline” (‘43). 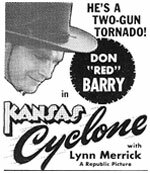 KANSAS CYCLONE (‘41 Republic) Barry, a geologist from Kansas, is suspected of being one of the gold ore bandits and jailed by Sheriff William Haade, who is secretly in league with the bandits. Haade, basically an honest man, needs money to take his sickly wife east for her health. Working to trap the bandits, Don is tricked and about to be hung by the enraged townspeople but wait—there’s a few surprises left! There’s one amusing scene in the saloon when Don knocks out three heavies 1-2-3 as they all fall in a perfectly straight row. Black actor Charles Watts turns in a purely stereotypical and humiliating “yas-suh” performance. 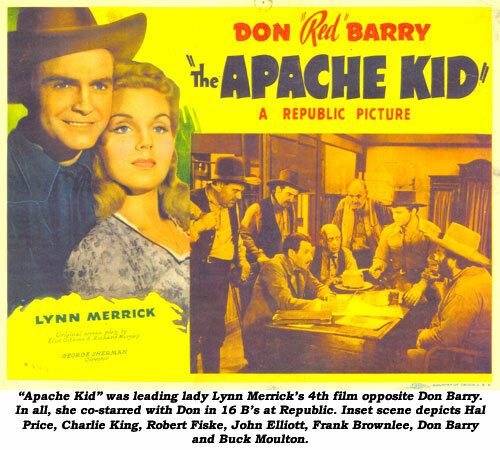 APACHE KID (‘41 Republic) Although there’s enough action, this is somehow a fairly tame Barry western. Producer/director George Sherman made a slight misfire with first time scripter Richard Murphy’s plot which has elements of this and that as slick schemer Robert Fiske and his unhappy “part-ner”, LeRoy Mason, devise a plan to trick immigrant settlers into building the main road to Oregon in exchange for phony land promises. Trusting his uncle, Fiske’s nephew Barry has brought the latest group of settlers into the Valley. There’s no sidekick role as such, with black comedian Fred “Snowflake” Toones and (we assume) Don’s dog, Duke (used in other Barry features), along with soon to be resident PRC saddlepal Al St. John as a stage guard doing their best to add some comedy relief where there is none. 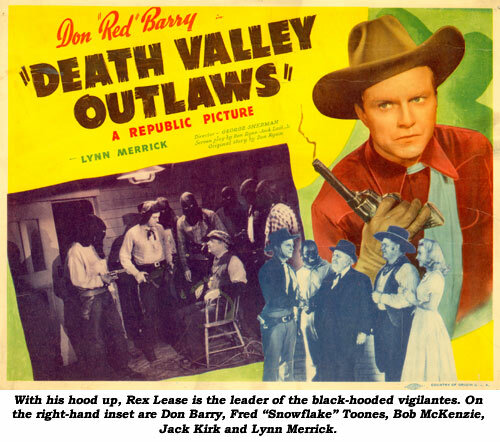 DEATH VALLEY OUTLAWS (‘41 Republic) One of Barry and Republic’s most action-packed hours from director George Sherman in a serial-like manner. Crooked banker Karl Hackett forces ranchers to take out large insurance policies naming him as beneficiary in order to secure loans. Then his black hooded vigilantes raid and burn ranches to collect the insurance. Don Barry (and his dog Duke), searching the west for his long lost brother, swears to “pay ‘em off” and passes himself off to the vigilantes as a tough outlaw and discovers gang member Milburn Stone, who is trying to quit the gang, is his long lost brother. 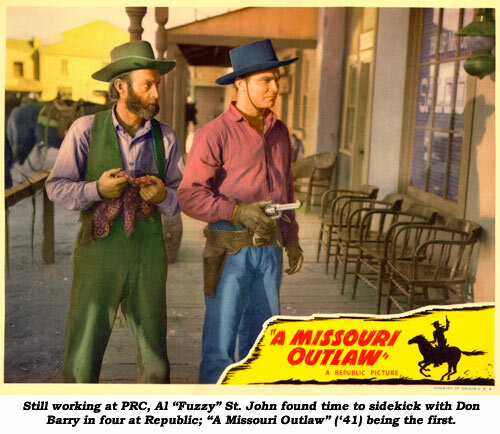 A MISSOURI OUTLAW (‘41 Republic) Barry returns to his hometown of Sundown where his father, Noah Beery Sr., is sheriff and is determined Don must face trial on a trumped up murder charge to clear himself. Don believes he won’t receive a fair trial from racketeers who are operating a dairymen’s protective association. When Don’s father is murdered by the gang, Don is mistakenly blamed. On the vengeance trail, one by one, Don tracks down the men responsible. 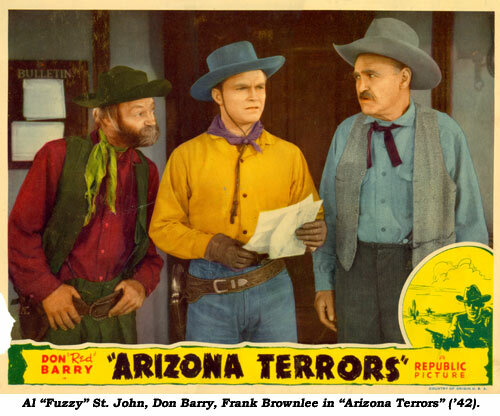 ARIZONA TERRORS (‘42 Republic) In this remake of the 3 Mesquiteers “Night Riders” (‘39), Barry and his pal Al “Fuzzy” St. John expose a phony Spanish land grant swindle perpetrated by gamblers. The assassination attempt on President McKinley (played well by Dell Henderson) in 1901 is neatly woven into the storyline. RKO must have seen one or the other as they incorporated much of the storyline again into Tim Holt’s “Red River Robin Hood” in ‘43. 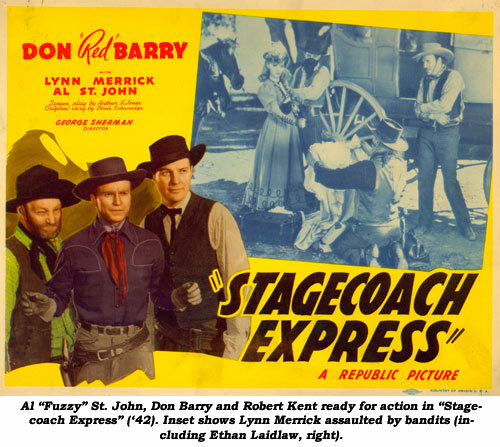 STAGECOACH EXPRESS (‘42 Republic) George O’Brien’s “Stage to Chino” (‘40 RKO) is reworked here as saloon owner Guy Kingsford and his gun-slingers plan to ruin stageline owner Lynn Merrick’s business and grab off the franchise for themselves. Merrick’s manager, Emmett Lynn (in a straight role for a change), is double-crossing her, gaining inside info as the secret boss of the gang. JESSE JAMES JR. (aka SUNDOWN FURY) (‘42 Republic) Don isn’t interested in following in his lawman father’s footsteps until his friend is waylaid and severely injured. It’s then Don begins to live up to the fighting nickname of Jesse James Jr., going into action-overdrive against Karl Hackett and his men. Al St. John, beard and all, has perfected his Fuzzy routines—including the comedic expert use of his bicycle. Now he was fully ready to ride the range with Buster and Lash. 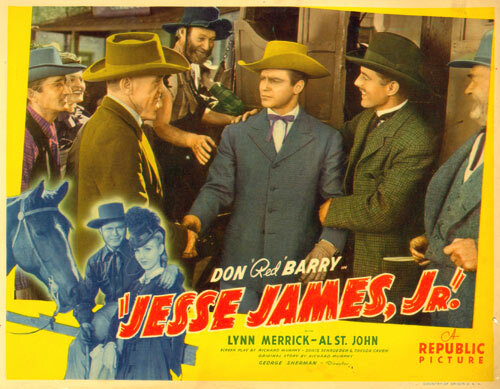 CYCLONE KID (‘42 Republic) John James, kid brother of Don Barry, has come west as a doctor only to find brother Don slinging his gun as the Cyclone Kid in the employ of big cattlemen pushing small ranchers out of the valley. When James stirs the ranchers to rebel, Barry is ordered to drive James out of town. Barry sees the error of his way and organizes the ranchers to band together to fight the outlaws. 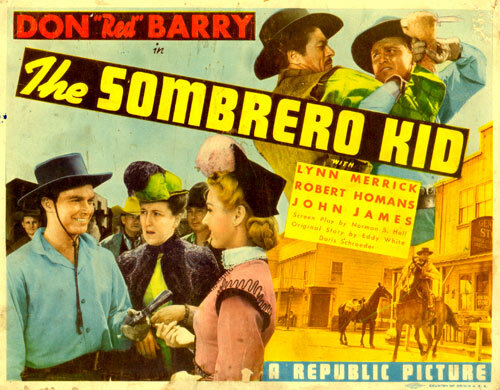 SOMBRERO KID (‘42 Republic) Action-packed but complex yarn forces competent director George Sherman to whiz by some of the plot points a bit too quickly. Marshal Robert Homans raises two sons—Don and John James. When their father is killed, nasty banker Joel Friedkin reveals one of the brothers is the son of an outlaw. On top of that, Barry, James and Friedkin’s wastrel son, Rand Brooks, are all vying for the affections of Lynn Merrick, the ward of evil Friedkin. Previous Tex Ritter/Tom Keene cactus comedian Slim Andrews supplies some comic relief here, but Barry wanted no part of playing scenes with someone much taller than he, therefore, Slim only made two with Barry. OUTLAWS OF PINE RIDGE (‘42 Republic) If Noah Beery Sr. is made governor, the out-laws are through, so they frame Beery’s son, Clayton Moore, for murder. Wandering cowboys Barry and Emmett Lynn come to the rescue of Beery, Moore—and Moore’s sister, Lynn Merrick. Action ace William Witney’s first western as a director and he packs it with action, stunts and good camera work all the way.